"Thus Richard Madden's role in Bodyguard has done wonders for his profile, Rose Leslie has the part in The Good Fight, Jason Momoa is building a reasonably respectable action career. "Momoa may only have spent a couple of years on the show, but has since played Aquaman, which made more than $1bn ($760m) at the box office, and is now one of the most distinctive faces in Hollywood.She adds: "The likes of Jon Bradley and Hannah Murray [Gilly] will probably get parts on British TV even if not Hollywood. "But Hollywood has already come calling for several of the show's biggest names. Along with Momoa, Emilia Clarke is possibly one of the most obvious examples of a GoT star who has achieved big-screen success.She has landed leading roles in several major films since playing Daenerys Targaryen.Clarke acted opposite Sam Claflin in the 2016 film adaptation of JoJo Moyes's best-selling novel Me Before You, and last year portrayed Qi'ra in Solo: A Star Wars Story.But Hughes says Clarke is someone "who might well struggle" with other roles going forward. "Hers is such an iconic role that its hard to break free from it, and so far her non-GoT choices haven't been that good. "Shaking off your most famous role is something actors have long struggled with. "It's really hard to be cast in [a dramatic film]," Friends actress Jennifer Aniston said in 2015. Especially if "you're someone who is battling a persona. Sometimes it's hard to disappear from it in a role." Similarly, Alfonso Ribeiro has found it difficult to break free from his portrayal of Carlton in The Fresh Prince of Bel-Air in the 1990s. "It has forced ME to be my character," he told Metro in 2017. "I would like to try some stuff that is different from how the world sees me, just sink my teeth into… shoot, I could be a deranged killer! "But I doubt someone would automatically think of me when they go, 'We need to cast a killer, let's get the dude who played Carlton'. "Therefore, the Game of Thrones actors who were already well-known prior to the show may find it easier to shake off their characters. "The established stars such as Peter Dinklage and Lena Headey will probably go back to solid careers," says Hughes. "Even if they've played icon parts they're still just stops in longer careers and Headey's really raised her profile since GoT." Some of the younger cast members, like Sophie Turner and Maisie Williams, were less established as actresses when they were cast but are now highly likely to go on to further success.Both were in their early teens when they were first cast as Sansa and Arya Stark respectively, and now the show is drawing to a close they're getting the chance to branch out artistically.Turner, for example, will star alongside Jennifer Lawrence and Michael Fassbender in Dark Phoenix later this year.Williams, meanwhile, has been seen in Mary Shelley and appeared in a few episodes of Doctor Who in 2015. But, she said in February, she's not even sure she wants to become the next major Hollywood star. "Now that I'm 21, people have been saying to me when this show finishes, you're going to have your whole life and lots of opportunity," she told BBC News. "I'm asking myself a lot of questions like, what do I want in my life? "Most of the films that I see in the cinema right now don't really interest me. "And unfortunately the [film scripts] I read that I really love, they just don't get funded. People aren't funding indie movies in general. "A look at some other cult TV shows can tell us a lot about the mixed fortunes the various cast members can receive.Take, for example, The Wire - another HBO show which is widely regarded as one of the greatest TV series of all time. After its launch in 2002, it was widely praised for the opportunities it provided its huge cast, many of whom were real-life Baltimore residents with no acting experience.But while it was a springboard for the likes of Idris Elba and Dominic West to go on to much bigger roles, many of The Wire's other stars have disappeared.Several Thrones stars have already taken advantage of the considerable profile boost they've received from being on the show.Kit Harington may be one of the most recognisable names among the cast thanks to his portrayal of Jon Snow.Since leaving the show, he has appeared in a West End production of Doctor Faustus, as well as films like Pompeii and Testament of Youth. "He got very good reviews on stage recently which suggests that he might be capable of building a wider career which I wouldn't always have said," says Hughes. "He might be a better actor than I thought.... he's definitely thinking carefully about what happens next." Gwendoline Christie's roles since joining Game of Thrones in 2012 have included a part in Star Wars: The Force Awakens and a major role in Top of the Lake alongside Elisabeth Moss. "She's someone who you think might have been defined by her role but really isn't, possibly because she's so interesting as a person and has the modelling side career," says Hughes. "Plus she really seems genuinely unconcerned by what might come next, and has the Star Wars franchise which helps. 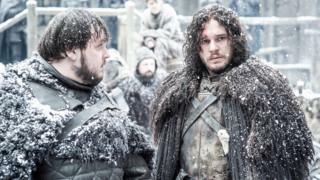 "Hughes adds that some of the less well-known GoT actors could be worth keeping an eye on. "I do wonder about someone like Nikolaj Coster-Waldau who I think is excellent on the show. I'd like to see him get some decent roles - he's got an interesting vulnerability under the wisecracks. "Game of Thrones is broadcast in the UK on Sky Atlantic at 21:00 BST on Monday.Follow us on Twitter @BBCNewsEnts, on Instagram at bbcnewsents, or email entertainment.news@bbc.co.uk.